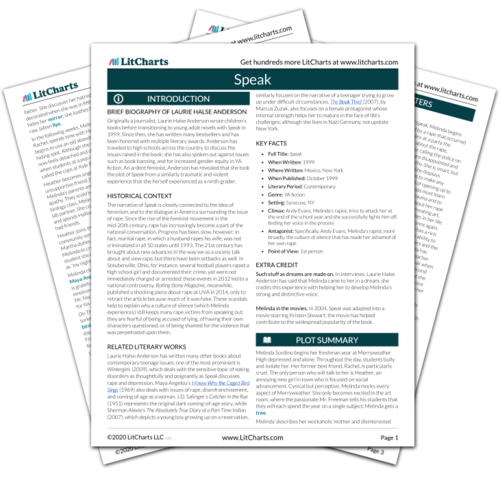 Instant downloads of all 946 LitChart PDFs (including Speak). 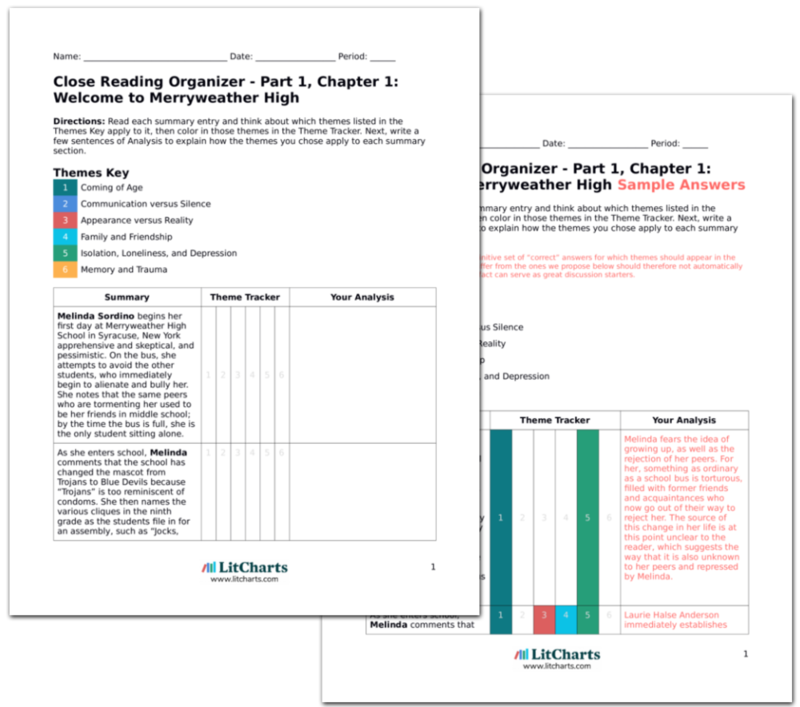 LitCharts assigns a color and icon to each theme in Speak, which you can use to track the themes throughout the work. At lunch, Melinda doesn’t know where to sit as all of her former friends pretend to ignore her. She discusses the social taboo of bringing a brown bag lunch from home, but is disgusted and bewildered by the food offered in the cafeteria. She thinks about sitting with Heather, but contemplates that she could also “crawl behind a trash can” or throw out her lunch and leave the cafeteria entirely. As she hesitates behind a tall boy she names Basketball Pole, Melinda gets hit by a spoonful of potatoes, and the entire cafeteria erupts in laughter. It is unclear whether she’s been hit accidentally or on purpose, but regardless, she flees. Melinda feels unsafe and watched everywhere she goes. While her friends abandon her, the authority figures who should be helping her either ignore her or outright bully her. No one understands her, or even attempts to do so; and the way that the novel doesn’t reveal any of Melinda’s background makes the reader feel her isolation even further. Even when she tries to be invisible, Melinda inevitably ends up humiliated and rejected by her peers. Feeling victimized and targeted, Melinda believes that she has no choice but to isolate herself—it is the only way to keep herself safe. Throughout the book, Mr. Neck bullies and singles out Melinda, acting in a way that is unfair and unprofessional. Hoyt-Disick, Gabrielle. "Speak Part 1, Chapter 3: Spotlight." LitCharts. LitCharts LLC, 4 Sep 2015. Web. 24 Apr 2019. Hoyt-Disick, Gabrielle. "Speak Part 1, Chapter 3: Spotlight." LitCharts LLC, September 4, 2015. Retrieved April 24, 2019. https://www.litcharts.com/lit/speak/part-1-chapter-3-spotlight.